Outis Fumetti who's Joe Shlabotnik ? Charlie Brown reads some bad news about his hero in the strip from July 30, 1964. Joe Shlabotnik is a retired major league baseball player and, like all adults, an unseen character in the world of Charles M. Schulz‘s long-running comic strip, Peanuts. He was first referred to by name in the Sunday strip from August 18, 1963, although Schroeder mentions a pianist named “Joseph Schlabotnik” in the February 22, 1957 strip, and a storyline which ran between May 7 and May 10, 1963 revolves around the distress caused to Charlie Brown when his unnamed favorite baseball player is sent down to the minors. Joe Shlabotnik’s less than stellar baseball career would go on to cause a great deal of similar upset to Charlie Brown for many years to come. Nevertheless, Charlie Brown would remain a devoted fan of Shlabotnik. 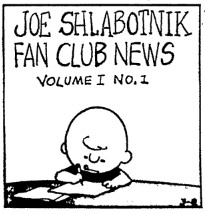 Charlie Brown creates a Joe Shlabotnik fanzine in the Sunday strip from March 8, 1970.